After the enormous after-hours sell-off on January 15, 2014 (when the stock lost nearly one-third of its value overnight), few analysts foresaw this great turnaround from Best Buy (NYSE:BBY). At the time, Best Buy was "slowly descending into the same secular decline hell where Barnes & Noble (NYSE:BKS) currently resides", and the presumed culprit was Amazon (NASDAQ:AMZN). Though Amazon remains a threat, Best Buy has thrived by cutting costs (fewer stores and employees), focusing on domestic stores and putting an emphasis on sales per store and earnings. We believe BBY will outperform the S&P 500 over the next 12 months due to its strong growth profile, attractive valuation, and track record of beating analyst estimates. There are other growth catalysts that we'll discuss as well, including: the improved economy, lower gas prices, the death of RadioShack (RSH) and potentially Sears (SHLD), and the new capital return program that promises a large "special" dividend, a higher regular dividend, and a share buyback program. In this report, we'll discuss why Best Buy is an attractive option for investors looking for value and growth. Based on traditional value metrics that have been empirically shown to predict stock returns, BBY is strongly undervalued relative to the market. 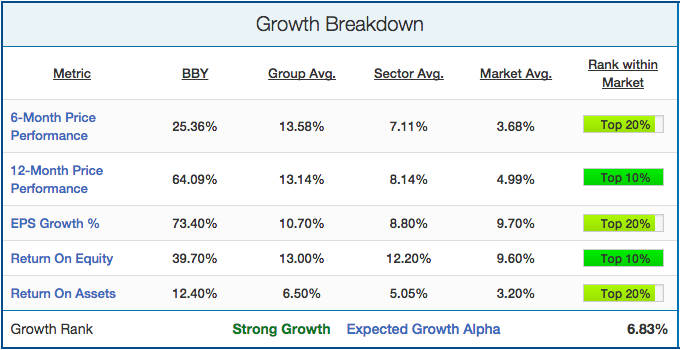 BBY also has a strong growth profile and has been beating analyst estimates recently. Again, the metrics used to highlight this have been empirically shown to predict returns and are thus extremely important to analyze. As we go through the report, we'll provide links to the academic papers or books that underpin our analysis so investors can see for themselves why each metric is important. Investors looking to dig deeper into the academic research can check out our post here, which outlines the major academics and their research. By all measures, Best Buy is a really attractive momentum and growth stock. Even with the strong growth seen in specialty retail in the past six months, Best Buy has outpaced the group by nearly 100%. When you open that horizon to 12 months, Best Buy has performed even more exceptionally well. Its 64% price gain in the past year is better than 90% of its group, 94% of the consumer discretionary sector and 95% of the general market. Further, BBY's ROE and ROA are also both really impressive and higher than ~90% of the market (ROA at 12.40% is higher than 89% of the market). With momentum on its side and strong growth metrics to back it up, Best Buy has plenty more room to grow. The biggest takeaways from this value profile are the strong sales yield, earnings yield and free cash flow. At 285%, BBY's sales yield implies that the company generates $2.85 for every $1 invested in the company. That's more than twice the specialty retail sector average and more than three times the consumer discretionary average. Its earnings yield at 8.64% (implied P/E of 11.6) is also nearly twice the group, sector, and market averages that all hover around 4.50%. Though its dividend yield (2.27%) hovers around the market average (2.12%), investors can be optimistic about future dividend hikes as the company recently announced an increase and a special payout. 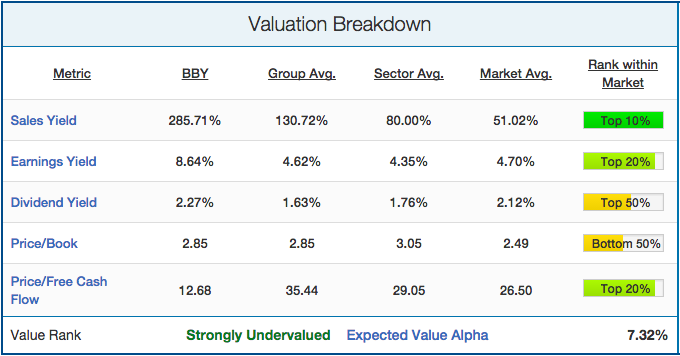 BBY's price to book is right in line with group averages, and is only slightly higher than the market average. Finally, at only 12.68 price/free cash flow, BBY is cheaper than 92% of its group, 86% of the sector, and 84% of the market. It's rare to find such value in a stock with BBY's momentum. 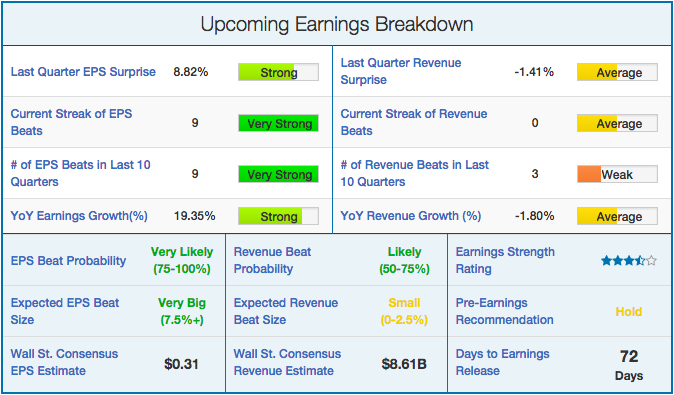 With 9 EPS beats in a row, there's a very good change that BBY will continue to beat going forward into their next announcement (expected on May 22). Not only has Best Buy beaten 9 consensus estimates in a row, they've beaten them by an average of 12.33%. Stocks don't often beat 9 times in a row, but for them to beat by such a wide margin is exceptional. We expect this trend to continue and for BBY to beat next quarter estimates by +7.5%. Now that we've analyzed the numbers, it's important to consider qualitative factors and potential catalysts for growth / risks. Firstly, we expect the drop in gasoline prices to help Best Buy going forward as consumers recognize the savings and have more cash to spend on discretionary purchases such as electronics and appliances. The dropping unemployment rate and recovering economy may also be catalysts for BBY for that same reason. Also, with RadioShack recently declaring bankruptcy and Sears anticipated to do the same soon, we expect sales to continue to show an uptick as customers will have to buy their goods elsewhere. Many analysts continue to expect Best Buy to go the way of RadioShack because of competition such as Amazon and other big-box retailers (Costco [COST] and Walmart [WMT]). However, there's a case to be made that Best Buy can differentiate itself by focusing on their core capabilities: high-end electronic goods such as TVs, computers and tablets. Best Buy has a competitive advantage with these high-end goods as their sales staff is more knowledgeable than big-box retailers, and their brand is strongly associated with electronics. BBY is also showing growth in its ecommerce platform, which should spur further sales growth for the company moving forward. It also has the advantage of being able to use their stores as local warehouses to ship their ecommerce sales from, lowering shipping costs and making them more price competitive. Finally, Best Buy's management has proven to be investor friendly. The recent dividend announcements mean that investors will receive nearly twice the payout that they received last year, and it signifies that management is confident about BBY's future earnings growth. Pair that with the $1B share buyback that it's planning over the next 3 years and Best Buy becomes even more attractive. With all of these factors in mind, we are bullish on Best Buy and expect it to continue to outperform throughout 2015. It's hard to ignore a stock with such strong price momentum, growth, and value. Though we recognize the real risks associated with competing with Amazon and other big-box retailers, management has proven thus far that we have reason to be confident in their ability to differentiate themselves. People have been saying that Best Buy was finished for years, and yet it's back and nearly as strong as ever. With investor-friendly management in place, we look forward to a strong 2015 for Best Buy.